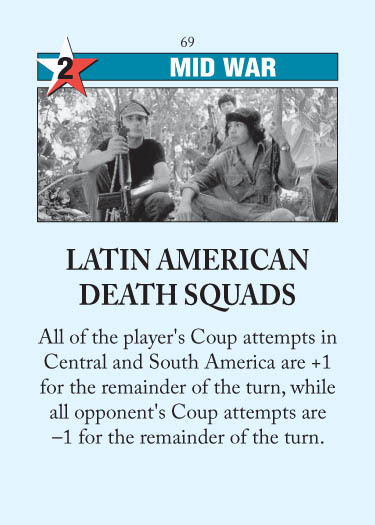 A somewhat speculative headline, Latin American Death Squads is most useful when engaged in a battle for Central America (as the coup targets are better than in South America). It can also be used as a prophylactic defense for one of your battlegrounds in case your opponent gets the battleground coup. The main limit to its usefulness is that you don’t really need that many non-battleground coups. Therefore, events that allow more battleground coups by either side (SALT Negotiations, How I Learned to Stop Worrying, ABM Treaty, Nuclear Subs, etc.) all make LADS more useful, provided that South America/Central America is yet to be scored. This entry was posted in Mid War, Neutral Events and tagged latin american death squads. Bookmark the permalink. Just to be clear: the opponent’s -1 to coup attempts applies only to coups in the Americas, right? Seems the clear way to read the spirit of the card, but the letter of the card seems ambiguous. Yes, the card only affects coups in the Americas. As far as I know, this kind of phrasing is actually common, as it avoids unnecessary repetition. If the latter sentence was to apply in another region (or globally), it would be mentioned separately. Any native English speaker may feel free to correct me, though. It seems to me that there’s actually quite a bit of sloppy or counterintuitive writing in Twilight Struggle—to take just one example, the fact that ‘played’ on RS/P applies to not just conventional plays but discards as well—and so I’m careful now to look up rules clarifications! If US plays it in headline, would it degrade the effect of Junta?